What Can Xavor’s Digital Workplace Strategy and Roadmap Services Do For Your Business? 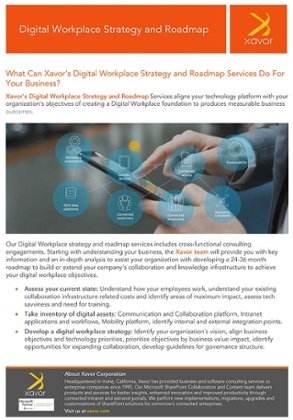 Xavor’s Digital Workplace Strategy and Roadmap Services aligns your technology platform with your organization’s objectives of creating a Digital Workplace foundation to produces measurable business outcomes. Our Digital Workplace strategy and roadmap services includes cross-functional consulting engagements. Starting with understanding your business, the Xavor team will provide you with key information and an in-depth analysis to assist your organization with developing a 24-36 month roadmap to build or extend your company’s collaboration and knowledge infrastructure to achieve your digital workplace objectives. Assess your current state: Understand how your employees work, understand your existing collaboration infrastructure related costs and identify areas of maximum impact, assess tech savviness and need for training. Take inventory of digital assets: Communication and Collaboration platform, Intranet applications and workflows, Mobility platform, identify internal and external integration points. Develop a digital workplace strategy: Identify your organization’s vision, align business objectives and technology priorities, prioritize objectives by business value impact, identify opportunities for expanding collaboration, develop guidelines for governance structure. Select tools and technologies: Evaluate platform approaches including online, on-premises and hybrid, evaluate licensing models, establish a technically viable path for existing solutions migration to new platform. Develop execution roadmap: Phased roll-out plan for solutions and services, corresponding plan for migration of existing assets, change management plan and guidelines, risks and mitigation plans, identification of performance metrics to measure success. Microsoft Office Online and Microsoft SharePoint is a comprehensive platform that serves as the foundation for digital workplace. This modern productivity platform offers greater mobility and flexibility, the ability to scale and establish global reach, and the security to protect their IP, assets, operations, and data. Xavor’s consulting team will allow your organization to make the most of your investment with this platform to realize measurable business value such as increased revenue, reduced operations costs, accelerated time to market, improved customer experience and increased employee satisfaction. Drive greater business efficiency and reduce expenses with solutions that streamline business operations and IT infrastructure management. Manufacturers will increase their profitability, security and agility by optimizing operations using the secure and flexible Microsoft Cloud Platform. Connect your employees with the information they need so they can get more done and experience greater job satisfaction. Microsoft’s tools enable your staff to be more mobile, more collaborative, more intelligent, and more intuitive, without sacrificing trust or security. Put the customer first and build profitable, loyal relationships using technology that provides insights about your customers. Smart cloud technology from Microsoft will help a manufacturer of any size deliver a connected and personalized customer experience.